This post is sponsored by Rustica Hardware. All opinions above are my own and my honest feedback on the product and brand. [dropcap]I[/dropcap]t’s laundry room barn door reveal day! You can check out how this room makeover started in my design plan and before photos. I am completely in love with this space! Just walking into it makes my heart so happy! I cannot thank Rustica Hardware enough for their amazing product and for solving a huge design dilemma in our home. Removing our old laundry door and installing their bypass system has been a game changer for us, and completely updated our space. Rustica Hardware barn doors & hardware are now being sold at The Home Depot – check them out HERE and get a white barn door similar to mine HERE. Like all projects, I didn’t follow my design plan once we started working on the space. I decided to change our main light fixture instead of adding the wall lights. This fixture is very popular in farmhouse decor right now and it was only $27 from Lowe’s. It comes in chrome, but I used Rustoleum Spray Paint in Satin Black to match the barn door hardware. GET YOUR FREE LAUNDRY PRINTABLE! I love that the barn doors can be seen from our living room and I pass them as I go into our master bedroom. I’m not kidding when I say they put a smile on my face every time. If I could, I’d leave the lights on all the time too so I could sneak a peek each time I walked by. The laundry decal from my friend Kelly at Art by Kelly is the icing on the cake and is exactly what I envisioned when creating my design board. Again, I changed up the design plan and decided to go with a smaller decal at eye level rather than filling up the entire pane. Also, the design team at Rustica Hardware are genius for coming up with this bypass system with one single pane acrylic door and one two-panel door. As I slide the paned door, it catches onto the paneled door and then they both slide back together. It was the perfect solution for our small space. You can read more on why we decided that plan in my previous post. Just look at this stunning hardware, not only are the barn doors amazing but the hardware is absolutely superior. The flat black finish, industrial hangers, customized wheels, and tracking system all compliment each other beautifully. Plus, the instructions are very straightforward and make hanging this bypass track very easy. With our old in-swing door gone, we now have full use of our countertop and cabinets. It’s amazing how much bigger the room seems now. On the counter, I chose to keep our small trashcan and jars for laundry items. I spray painted the trashcan and lids of the jars satin black to match the light fixture and shelving. The little trashcan is perfect for throwing away dryer lint and used dryer sheets. I also added a little something else to the room – shiplap! You can see the tutorial here. It was a project that took me a little longer than I expected and I had trouble finding the perfect white, but I’m happy with end result. I painted the room using the same color as the rest of our home – Valspar Oatland’s Subtle Taupe. Because this room as no windows, the artificial lighting makes the color look a little different but I’m pleased with it. I also re-painted the trim, baseboards and moldings to match the Ultra White (also by Valspar) shiplap. I decided to just keep one shelf, instead of our previous two. The brackets are from Lowe’s and the wood is scrap from another project stained Minwax Special Walnut. I kept the decor simple and added items from around the house. The tobacco baskets are from Decor Steals and I purchased the boxwood topiaries from Marshall’s last year. I made this rack using scrap wood, paint, and hooks that I removed from a smaller coat rack from Decor Steals. I loved the rack but it was too small for the room, so I removed the hooks, spray painted them black and reattached them on a bigger piece of wood. The towels are from my friend Kay at In the Farm Kitchen Shop and the boxwood wreath is also from Decor Steals. As I mentioned in my previous posts, our laundry room is very small and just like the rest of our home, it’s lacking in storage space. Luckily, when we bought our washer and dryer we opted for the pedestal drawers that now hold our laundry soap and softeners. These white baskets from Target are perfect for sorting out clothes and I think I will label them in the next few weeks. The existing builder shelf was too high for me to reach, so they now hold stained crates from Michael’s filled with holiday decor. It was a great storage solution to an awkward and unusable space. This little laundry room update might be my favorite project that we have done since moving into our home. It is such a white, fresh, and clean space. I love that I kept it simple and found solutions to our design dilemmas. It was once a space that I hated, but with a little love, it is now a great space for our family. What do you think of the new space and our laundry room barn door? Be sure to check out Rustica Hardware if your thinking of adding a barn door to your home! See how we are still loving the space almost one year later and a few changes I’ve made – HERE. Super bright & clean!!! Love it, Allison! Happy Tuesday! This is so gorgeous, I love it! Pinned! This is such a cute laundry room. I especially love the stained wood crates and shelf, and the printable. Great job! Oh my gosh this is so nice!! I think I would actually enjoy doing laundry in this space!! Haha, thanks Jen. I love doing laundry now! This is so beautiful and still on the hunt for a window paneled door for a laundry redo starting up soon. Can I ask what type of light bulbs you use or recommend for a space like that? Daylight bulbs or soft lift bulbs? This bulb is a 100 watt LED soft white bulb. I needed something bright since we removed our old ceiling fixture and the light is more concentrated now, but still gives off plenty! I tried a daylight bulb but it gave a blue tint to the room, because of my paint colors. LOVE this! Our laundry room is also our mudroom and the entrance to our house. I wish I could just shut the doors and hide the mess! Hi Jill, It is the prefabricated thermoplastic tiles. You can find them at Lowes and Home Depot but they are cheaper on Amazon here: http://amzn.to/1jspG5V Hope that helps! would you be able to source where you got the print…I really like it! I have looked at Rustica and can’t find your hardware which makes the whole laundry room. Do you think it’s still available? How about the door as well? Not on the link in post. I have been looking all over for the doors you purchased, as I have limited space for my laundry room. I’m on a tight budget and am looking for an affordable option. Are the doors from Rustica Hardware and were they extremely expensive? 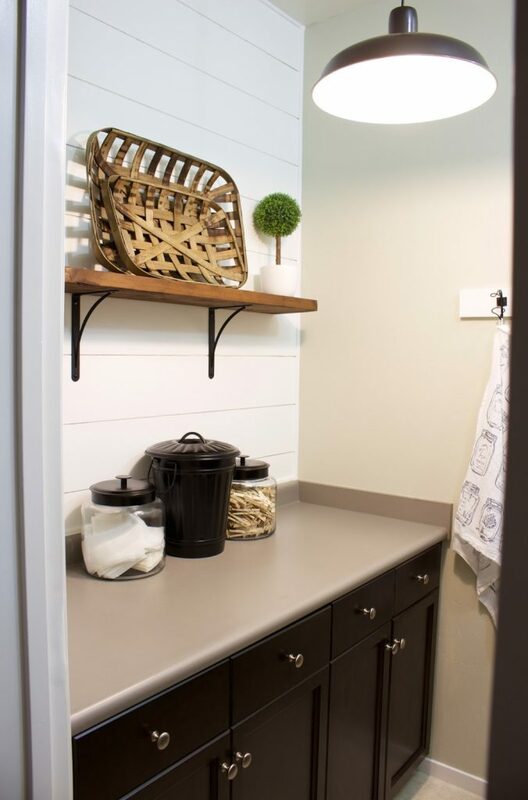 I love the way you transformed your laundry room. You are a great vision with a lot of talent. Hello! We are currently renovating a 1940’s farmhouse. I have a very small space to use as a laundry room. The size looks very comparable to yours. I was wondering if you would please share the dimensions of your laundry room. I really love the way it looks so neat and efficient! When the doors are completely closed are they flush with each other? Or they remain with one elevated over the other? They are not flush, the front door it still elevated over the other. But it’s hardly noticeable. Would you mind sharing the dimensions of your laundry room please? I’m not sure what they are exactly, probably 5×6 – not big at all. How much clearance do the doors need? I have about 3″ of room before they would bump into something. They are only about 14″ wide and bypass each other to save on space, not much clearance needed. Hello!!!! I love it. How big is the entire laundry room!? We are working with limited space and I’m trying to get a feel for what we need! Hello! Very small, probably 5×7. It’s small but functional! Your barn door looks great! I am in the process of building a house and am deciding on whether or not to put a barn door in the laundry room. However, I wonder how sound proof it is. So I was wondering if you could tell me if you can hear the washer and dryer through the barn door?